To help better answer some of the common questions about mouse performance, here's some basics about four things that determine how the mouse responds in-game: Maximum Turn Speed, Acceleration, Sensitivity, and Resolution. The biggest reason to love KeyMander can quickly become a frustration if the mouse isn’t setup properly, so here is some information that may help you to better dial in your mouse settings. 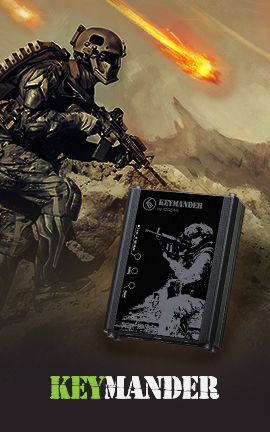 KeyMander is designed to provide as close to a PC gaming experience as possible on a game console, however there are a couple significant differences between playing on PC and using a keyboard and mouse with your console. Understanding differences in maximum turn speed and learning how to work with mouse sensitivity and acceleration are the keys to playing at the highest level with KeyMander. Getting to that level requires some also time spent learning how your mouse settings translate into the game, and also understanding the limitations of console games. The biggest difference between playing on a PC versus playing on a console with KeyMander is the turn speed limitation built into console games. Because console games are built for joysticks, every game has a maximum turn speed equal to having the analog thumb stick pushed all the way to the farthest position. This is the turn speed limit of the game and it basically caps the speed at which you can turn (look) in a given direction, no matter how fast you move the thumb stick (or mouse as in our case). You can test this with your controller by pushing the right thumb stick all the way left or right, and the speed at which your view rotates is the maximum turn speed for that game. This limit can vary widely from game to game, and can even vary within a game depending on factors such as weapon choice, whether or not you’re in a vehicle, location in the game (especially in campaign modes), etc. Games can also have different horizontal and vertical turn speed limits, although vertical limits are normally less of an issue. It is important to understand the game's maximum turn speed and the effect it has on mouse performance, since a mouse can deliver faster average and peak movement speeds than a thumb stick allows. When you exceed the game’s maximum turn speed (moving the mouse faster than the game allows), the mouse will feel sluggish or "laggy" as your on-screen aim/look view moves less than expected. An easy way to see this is to move your mouse at a fairly slow rate noticing how far you rotate, then move extremely fast and compare. If your KeyMander profile is set up with very high aim/look sensitivity, you probably noticed that by moving slowly you rotated 360 degrees or more with a short swipe, but by moving very fast you rotated only a short distance. That poor movement you just experienced is NOT mouse lag, but rather the game's turn speed limit. The easiest way to understand what is happening is to equate the maximum turning speed to distance turned (rotated) in a period of time. For example, let’s say with the aim/look thumb stick fully engaged it takes our game one full second to perform a 360° rotation, that would make our game’s maximum turning speed equal to one rotation per second. Now to illustrate how that pertains to our mouse, let’s say that with our current KeyMander profile moving the mouse four inches in one second performs a full rotation; it would mean our max turn speed with the mouse is 4 inches per second. Now here is where the turn speed limit begins to show up with a mouse: if we move 8 inches in one second (double the limit in our example), the extra movement above the maximum turn speed is not registered and it’s as if you moved for only half the distance or half the time (equal to a half rotation for our example). Following the same formula if we move it 16 inches (four times the limit), your on-screen aim/look view moves only a quarter of the time/distance (equal to a quarter rotation for our example), and so on. Simply put, once you hit maximum turn speed, the faster you move the mouse, the slower you go. Unlike on a PC, using a mouse in an environment designed for a joystick also requires getting used to playing within the game’s turn speed limitation, but it’s a small trade-off for being able to play console games with a mouse and keyboard and it's easy to set up your KeyMander profiles to work within this limitation. One way to overcome turn speed limitations is through the use of in-game acceleration, which progressively boosts your aim/look speed the faster you move. Slower movements stay slow and precise, but quick movements ramp up the turn speed to make spinning around much easier in games with lower turn speed limitations. Acceleration is usually avoided by most PC gamers since noticeable turn speed limitations are rare in PC games, however some console game designers understand that acceleration can be beneficial at times, and have begun adding the option in some games. TitanFall 2 is a perfect example, having programmable acceleration levels and curves in the game’s settings menu. The KeyMander software also has adjustable acceleration and programmable mouse response curves to add similar functionality to games without these adjustments. When setting up your game profiles, remember to treat acceleration like salt at the dinner table; it’s there if you need it, but if it’s already good you probably shouldn’t add anything. Properly setting mouse sensitivity is the biggest factor in getting good mouse performance with your KeyMander, and there is more to it than simply adjusting the sensitivity sliders in the KeyMander software. There are actually three other steps required before adjusting the software sliders, and forgetting them will lead to poor mouse performance. The first and most commonly overlooked step in properly setting up the mouse is actually making sure the aim/look sensitivity is maxed out in the game’s settings menu, so you have the full sensitivity range to work within. Next, the KeyMander software has a settings menu where you need to input the mouse’s maximum DPI resolution for a smoother and more accurate adjustment range. Third, most gaming mice have a DPI button with multiple settings so make sure the mouse is set to the highest DPI step when connected to KeyMander. Only after those steps are complete do you begin making changes to the mouse sensitivity sliders. Just like in PC gaming, bumping the sensitivity too high will cause you to reach a point where movement can become jittery and difficult to use accurately for precision shots, so reaching a balance is important. In the PC world this equates to the balance between low DPI and high DPI settings, where lower DPI is far more accurate for making small, precise movements (like needed for headshots) at the cost of having to move your hand a foot or more to turn a 360° rotation. In the older days of first-person-shooters, gamers playing titles like Counter Strike on standard definition monitors might have mouse resolutions set as low as 100 or 200 dpi, so they can snap off a headshot (without a scope) like it’s nothing. That type of play is a far cry from the common Rambo-esque, hard-charging free-for-all styles we see now in Call of Duty deathmatches, so just like in PC gaming, finding your own balance point is the key. If you run around in CoD with a shotgun and never aim-down-sight, having a highly boosted sensitivity may be fine for you, but if you later decide to pick up a sniper rifle you probably aren’t going to be happy at that setting. To get a better feel for how to best set your mouse sensitivity, start at a point where you think the sensitivity is way too low, and move your mouse back and forth. Get a feel for the ability to find your aim point accurately, then boost your speed until you can get the accuracy you want, at a comfortable enough speed to stay within the game’s maximum turn speed or at least not far beyond it. Remember each game is different, and the difference can be huge when comparing a game like CoD: Black Ops III that has a high max turn speed, versus a game like Resident Evil 7 where you can use a watch to time how long it takes to spin around. By the way, several games actually have different horizontal and vertical look sensitivities that usually go unnoticed with analog sticks, but much more noticeable with a mouse. If vertical movement feels different than horizontal movement and you want to adjust it, you can unlock the horizontal and vertical mouse sensitivity sliders in the KeyMander software and adjust as needed. Follow up by adjusting the diagonal acceleration setting until movement feels even in all directions. As a final note, I should also mention that one of the things that can complicate getting proper mouse performance with high-end gaming mice is the manufacturer's custom mouse driver software, which often needs to be correctly configured on a PC so it doesn't default to some unknown/less effective setting. Mice from companies like Corsair, Logitech, etc. have downloadable drivers for setup, and usually store these settings in the mouse memory as configuration profiles. If you have one of these mice that stores profiles internally (especially Logitech mice as their software is a bit tricky), it is important to make sure you set the mouse to maximum resolution in their software first, and program it to default to that setting so the mouse is actually running at the full resolution offered. Because these settings have to be programmed using a PC, it will it will make your life much easier if you remember do this first before connecting the mouse to your KeyMander! After setting up your mouse, make sure to set the mouse resolution in the KeyMander software to match your mouse setting. Having a 5000+ DPI mouse is great, but if you forget to change the default setting in the KeyMander software (default is 2000 DPI) you won't getting the full benefit of all that resolution! Hopefully this gives you a better insight into how to get the best performance out of your KeyMander for the way you play. If you still have questions, please let us know. Is there a recommended dpi for use with the Keymander to ensure optimum smoothness? If all factors were equal, 2000 dpi is the minimum I would recommend as a rule of thumb. However, not all mice sensors are equal, so this could be higher or lower depending on the game and the mouse. Sometimes a lower dpi mouse with a great sensor can used with enough sensitivity boost to be playable, while higher sensitivity mice with a poor sensor may feel jumpy unless run at substantially lower sensitivity. Often some of the best gaming mice on the market perform their best at 1600-1800 dpi, so a high dpi range isn't a hard and fast rule. For skilled players looking to get the highest possible performance, I look to mice with a good gaming sensor and about 4000 dpi or capability. Keep in mind that having 16,000 dpi looks good on paper, but there is nothing to be gained at that high of sensitivity so don't let that be your deciding factor. I purchased a Rival 300 mouse (Pixart 3310 sensor) and it improved performance significantly. Sadly the left click went out the next day. Exchanging it for a Corsair m65 pro that has the upgraded Pixart 3360 sensor (comes with double the Rivals dpi as a bonus). I had some problems fine tuning the micro movements in all games but maybe the upgraded sensor will make the difference? You're recommending I use a lower dpi than the max (which is around 12,000 for the new mouse), but the setup says to use the max dpi in the Keymander settings. Are you saying to have the max dpi set in the Keymander software, and in my mouse software set the dpi to around 2,500 or so? Or do I need to match the dpi in both places? That's too bad, I liked the Rival when I tested it! The M65 Vengeance worked well, but I haven't tested newer M65 Pro, so I can't comment on it yet. When we originally launched the KeyMander several years ago most gaming mice had a maximum resolution under 10,000 dpi, so we would start with maxing out the sensitivity and work from there. Now it seems there is this dpi race among gaming mice, reminiscent of the megapixel race among digital cameras and many are pushing 12K to 16K dpi specs. Like in the megapixel comparison, the highest spec does not guarantee the highest performance. In some mice you will see minor issues (like smoothing) become more of an issue at the higher dpi settings, so setting the mouse for 16K dpi will not provide the best performance and would be completely outside the range of usable sensitivity anyway if it were being used on a PC. If you like the tweakie details into all things mice the overclock.net forums have a ton of great info. Here's some discussions on the 3360 vs the older 3310 sensor here and here. Well I can now say that the pro is much better than the rival. I found using max dpi and a lower sensitivity the provide the most smooth aiming across all of my games. The only issue I have so far with it is that you cannot save button mappings to the on board memory. There is a thumb "sniper" button dedicated to temporarily changing the dpi for finer aiming. If I could get macros to work it would be a non issue, but I can't get a single one to function in rainbow 6, on any mouse button. Can you be of any help? I set up the macro, saved, uploaded, enabled macro mode... nothing. Send me your profile and let's check it. I wear I did. I was following the steps per the manual last night but got on this morning and tried again and it worked.... I dunno lol but not complaining! The "sniper" button still doesn't work though sadly. I'm starting to think it is not supported by the software. Is there normally input lag in play/simulation mode? The button presses respont instantly but the mouse movement does not. I can remap the button through the corsair but remapping doesn't save to mouse onboard memory. So if I can play through play/simulation mode all my problems will be solved. I just practiced my google-fu on your mouse, and you are correct that it does not save macros or dpi in the on-board memory (at least as far as I found). That is a huge bummer! Have you looked at the Logitech G502? Ssshhhhh I knew someone was going to mention the g502 at somepoint :/ I love this mouse and I'm going to make it work. Got it for $35 at best buy (it's still on sale until Saturday I think, they accidentally put it on sale). I don't have the budget for the g502 sadly but it seems perfect. Is yours the Pro or Pro RGB? I will have to have our engineers look into it and see if it is a mouse issue or something we can solve with a minor firmware fix. We do make compatibility revisions when we find issues with popular mice and keyboards, so I'll need to order one to play with for awhile- I mean test for compatibility reasons! 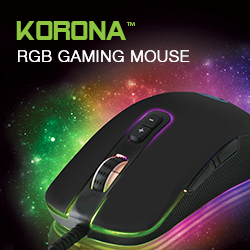 The pro rgb, it's a lovely mouse. The macros are being wonky again.. Macro mode is having an issue where it will beep once but not engage until I unplug the Keymander power source then plug it back in. Also is there a way to simulate a button being held down using the macros? When you say beep once, you mean after pressing F11, correct? If so, can you take a screen shot of your macro so I can see what timing and commands are in it? We currently do not have an adjustment for duration of button press in our macros, but it is something we have requested for a future firmware revision. Thank you, that's exactly the information I need to provide our engineers to review. I also need to know your version of Windows currently running. Since it isn't happening to the other mice, I'm thinking there is a compatibility issue with the Cue mouse software, but we will need to review it. I got the macros to work, just requires a reset of the Keymander after being left on and unused for a few hours. The mouse delay occurred on Windows 7 & 10. I tried uninstalling CUE on both and letting windows have full control over the mouse. The delay still occurred under all attempts. Was the PC still connected to the KeyMander when you had the problem, or have you experienced it without the PC connected? I'm ordering that M65 Pro RGB to try and replicate the problem. Still only happens with that mouse, and only when in Play Mode, correct? I'm assuming it also happens in Simulation Mode too, correct? I'm sorry it appears my reply didn't get submitted! I installed the logitech g502 software and the mouse latency seems to be gone! It was in play and simulation mode. I'll install the logitech software on the other pc and see if it fixes the issue there as well . The mouse lag is only in play mode, with the keymander connected to my pc, mouse connected to my pc, amd play mode enabled. Last night in an attempt to save button remaps to my mouse memory, I installed the mouse software from logitech for the g502. It didn't work but now the mouse input lag is almost non existent. Now when I enable play mode the lag will be there for maybe 2 seconds then fade to maybe a few hundred milliseconds. Playable but not instant like plugging the mouse directly into the Keymander. At this point im assuming that it's sort of driver capability issue with the Keymanders software program. In a bit I'll move to my pc that does not have the logitech G502 software installed and check for the input lag. If present I will then install the logitech software and re-test to check for improvement. We are having some problems right now with some forum posts getting flagged and held up in our moderation queue for review, I'm not sure why and our forum admin is still working on it. Hopefully fixed by early next week. I will keep an eye on the queue so I can release them faster if it happens to you again. It seems to be related to something with the Cue software. Hopefully our engineers can find an easy solution for it soon. When mapping my buttons I've come to find on Rainbow Six Siege when i assigned back on my mouse for lean right and knife when clicking it 50 percent of the time it is violently moving my right analog control and causing sharp movement on its own. I really want to try out the Steel Series Rival 500, but haven't yet. What kind of hotkeys are you assigning to the mouse ? And are these bindings done via the Logitech software ? Replied to your other post! What game are you on and are you using a profile from scratch? What kind of keyboard and mouse do you have? If your profile sensitivity is set to maximum, you are very likely exceeding the game's maximum turn speed as explained in the very first post above. Please let us know the answer to Marco's questions and be sure to use our sample profile for your game to get started.